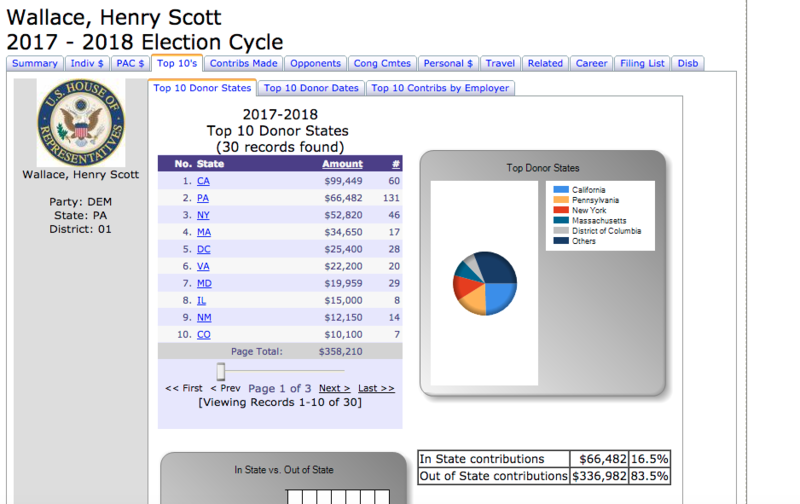 More than 80 percent of Democratic candidate Scott Wallace's campaign contributions are coming from outside of Pennsylvania, filings show. Wallace, who is challenging Republican Rep. Brian Fitzpatrick in Pennsylvania's 1st congressional district, is receiving a relatively meager amount of monetary help from individuals despite being in a pivotal toss-up race, relying instead on his own wealth to fuel his campaign. Wallace's campaign committee's most recent filings to the Federal Election Commission show that the Democratic candidate reports $5.4 million in total receipts. Of that amount, $4,834,000, nearly 90 percent, came from Wallace himself. The remaining amount has overwhelmingly come from individuals who live outside of the state. 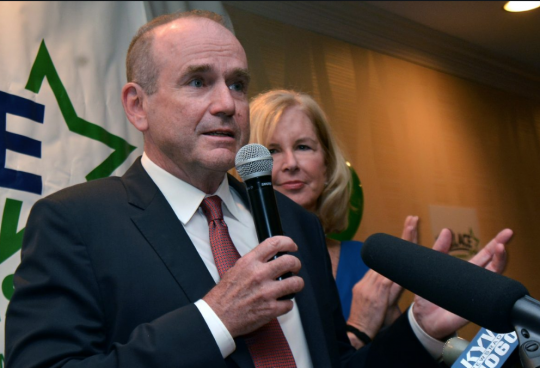 Donors in California have supplied Wallace's campaign with $100,000 in contributions, while individuals who live in nearby Washington, D.C; Maryland; and Virginia have contributed $82,250, combined. New Yorkers have added $52,820 to his campaign. Donors from 23 other states have also chipped in small amounts. Wallace has only pulled in $66,000 in contributions from Pennsylvanians, according to data compiled by Political Moneyline. Rep. Fitzpatrick, on the other hand, receives a majority of his campaign contributions from in-state donors, his filings show. 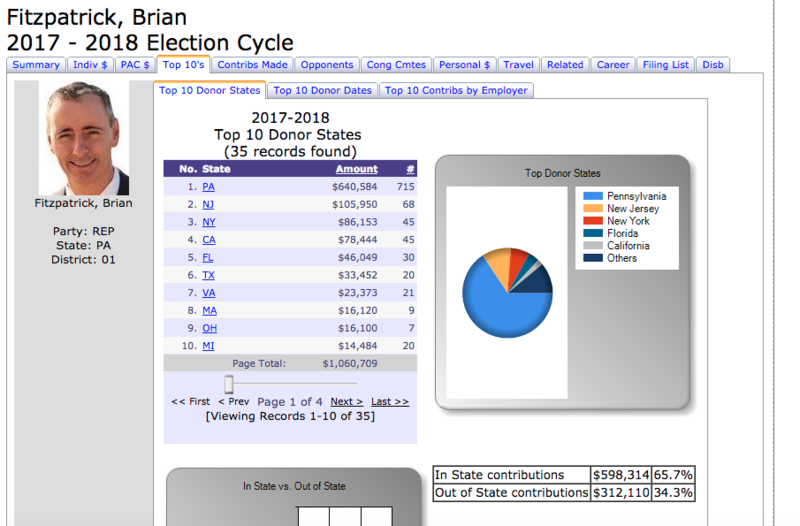 Overall, 84 percent of Wallace's individual contributions are from outside of Pennsylvania. Wallace's campaign did not respond to a request for comment on the donations. Wallace, who was born in Bucks County, Pa., lived outside of the district he is seeking to represent for years prior to moving back shortly before announcing he would run for the congressional seat. The Democratic candidate spent his time in South Africa and Maryland running the Wallace Global Fund, his family's foundation that has disbursed funding to a number of radical left-wing groups. Despite his foundation giving away millions, no money was ever given to groups of organizations located in Pennsylvania's 1st congressional district. Wallace told the Wall Street Journal that he last voted in Bucks County in 1978. Wallace did not even register in the county until late December 2017 and did not cast his first vote until the Democratic primary on May 15, records previously obtained by the Washington Free Beacon show. Wallace is additionally a partner of the Democracy Alliance, the left's biggest secretive left-wing donor network that was co-founded by liberal billionaire George Soros. Soros and his son, Alex, have donated to Wallace's campaign along other board members of the alliance. Wallace is also a member of Patriotic Millionaires, a group of wealthy Democrats who want to "overhaul America's framework."